Brewed annually since 1995, Nutcracker Ale returns to draft walls and shelves beginning in the Greater Kansas City Area on October 15th with other regions to follow soon! A showcase of spicy Chinook hops, Nutcracker Ale is best classified as a winter warmer ale. Arguably English in origin, more traditional examples of the style, Nutcracker included, are not spiced while some iterations are spiced following the wassail tradition, often including cinnamon, cloves and nutmeg. Dating back to its inception, Nutcracker Ale has never been spiced, but the zesty character of the Chinook hops often leads folks to believe they’re drinking a spiced beer. With just shy of 40 IBUs, Nutcracker Ale leans heavily on Chinook hops for bold flavor and aroma, but the malt base is quite robust featuring layers of complexity provided by a blend of two-row pale malt, Amber 50, Cara 300, Munich malt and just a touch of malted wheat. This complexity is deepened by additions of golden brown sugar and dark brown sugar midway through the boil. Nutcracker Ale is hopped with Magnum, Chinook and Cascade on the brewhouse and dry-hopped with Chinook just before the end of fermentation. 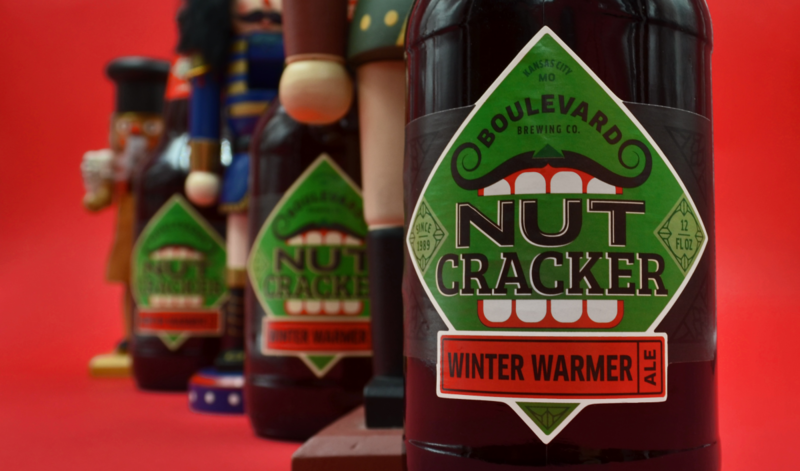 Boulevardians look forward to the return of Nutcracker Ale each year not only because the beer is delicious, but also due to the fact that we feature every single employee’s name and how long they’ve been at Boulevard on the neck labels. They’re randomly mixed in as the labels are loaded on the labeling machine and are spread throughout our distribution network. Hey, mom & dad! My name’s on a beer bottle! Regions that typically see Boulevard seasonal beers like Irish Ale and Bob's '47 should expect to see Nutcracker Ale in the coming weeks. Please note that we do not have access to our distributors' delivery schedules and will be unable to confirm when Nutcracker Ale is available near you.